"Holy habitat! ", Batman. What's a giant spider doing climbing our chimney? Influenced by E.B. White and Charlotte's Web, I decided to approach the spider as friend, not foe, and asked if it would kindly pose over our front door for Halloween. It proved to be an obliging spider, and will save us trying to find the fake spider stowed somewhere in the basement. If the truth be known, these photos were generated a month ago when my standard approach to the house was suddenly complicated by some seriously strong fibers some twenty feet out. Suburban navigation is not usually impeded in this way. The fibers extended from a tree limb down fifteen feet to the ground, and held a spider calmly consuming its most recent catch, which appeared to be a yellow-jacket. While I was thanking it for its good work in reducing the population of stinging insects, it apparently decided I would be too cumbersome to wrap up, and so headed back up to the tree limb, there likely to reconsider its web placement. When I returned half an hour later, one of the two main vertical strands of the web had disappeared. The Wikipedia page on spider webs states that spiders often consume their own webs--a sort of recycling that is problematic for humans with store-bought Halloween webs. For E.B. White fans, there's a good interview about the book "The Story of Charlotte's Web: E. B. White's Eccentric Life in Nature and the Birth of an American Classic" on NPR's Science Friday from August. It details White's careful research of spider behavior. Most amazing for me, watching the Charlotte's Web movie with my daughter years ago, was the "ballooning" scene, in which the young spiders make silk strands that become their sails to ride the wind to new locations. A big white oak, veteran of many storms, finally met a windstorm it couldn't match. All its sprawling limbs came crashing down, leaving the trunk as a monument to its long and acornful life. The monument even bears its name on a label attached fifteen years ago as part of an eagle scout project. One limb decided to patronize a heavyduty picnic table--those old tables that loom like lost battleships in the overgrown woods at Community Park North, strong enough to last for centuries but so uninviting and misplaced they never get used. The tree was hollow, and last year rather gruesomely sported a raccoon that had sadly gotten stuck trying to exit through a hole 15 feet up. Now, in its long life after death, it will begin the slow return to soil, sheltering and feeding life of all sorts in the process. Serendipity can really add to the flavor of food. How else to explain the delicious taste of serviceberries encountered several summers ago out along Route 1 in front of the FedEx store, formerly Kinko's. The tree--more like a shrub, or a shree or a trub or maybe a trush, given its size--is still there. Hopefully it doesn't get sprayed when bearing. I mention it in case anyone is planting in fall, or wants to daydream through the winter of new native fruits to try out next year. It must be a cultivar, because the unbred serviceberries I planted in my yard years back have not borne anything to rival its berries' size and taste. Maybe FedEx could be talked into boxing up theirs and sending it along. Serviceberry (genus Amelanchier) is also called shadbush, because it is said to bloom in early spring when the shad migrate up New Jersey's rivers to spawn. A cluster of mature serviceberries, of tastiness unknown, can also be found near the play equipment behind Community Park school. "DR Greenway's St. Michaels Farm Preserve is host to a new pilot project in native seed production that could change the future of conservation. The 13 species of native seeds being grown at the site, with support from the Natural Resources Conservation Service, will be used to restore landfills in New York City and will contribute to a Mid-Atlantic Native Seed Bank. New York City Parks is our partner in this project, led by naturalist Ed Toth, Ph.D. Seed is a critical natural resource that has been largely unrecognized, unprotected, and undermanaged. Locally adapted seed sources are widely acknowledged as critical for habitat restoration because they do not pose a genetic risk to surrounding native plant populations. However, our seed resources are in danger of being lost from misuse of non-local source seeds.Learn how to begin to wisely manage resources through seed banking and seed networks to prevent the extinction of these critical natural resources." 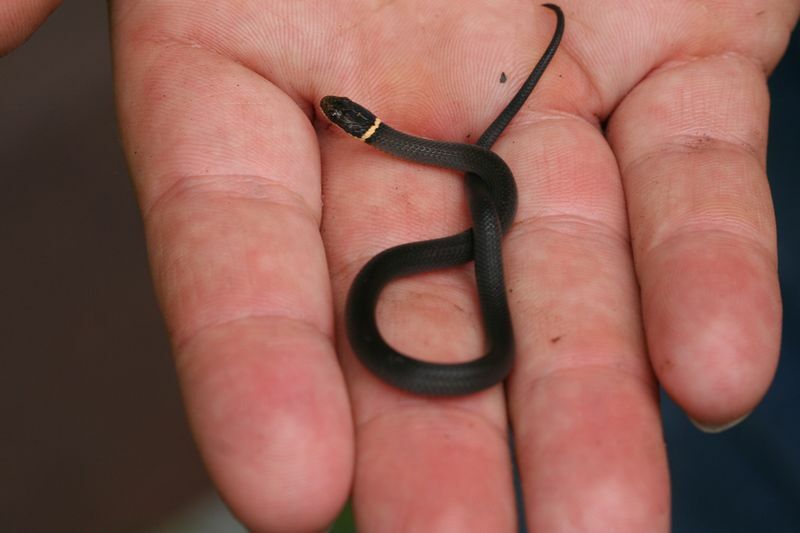 Why did the Ring-necked snake cross the road? Answer #1: Because the habitat is always greener on the other side. Answer #2: So it could learn its name from a biologist passing by. Thanks to Tim Anderson, environmental science teacher at Princeton High School, for the photo and email below. There's long been talk of putting "Turtle Crossing" signs along the driveway up to Mountain Lakes House. Here's another denizen of the woods whose wanderings sometimes intersect with asphalt. For all those who happen to be fancy free and wanting to get out tomorrow, I'll be leading a nature walk through the color-coded forest at Herrontown Woods in the morning. Meet at 10am at the preserve's parking lot, which is at the end of the deadend road opposite the Snowden Lane entrance to Smoyer Park. Included in the walk will be a visit to the grounds of the Veblen Farmstead, and a discussion of recent progress towards preserving and restoring the long-boarded up buildings there. Anyone for a little topiary? This shot was taken last week at Princeton Battlefield, where the battle for Princeton's open space is currently being won by the kudzu of the north--porcelainberry. A vine native to northeast Asia, porcelainberry is related to grapes, and grows over ground, shrubs and trees like a grapevine on steriods. It has beautiful berries, which may have helped gain it transport originally to our continent, but its rapid advances along the DR Canal, at the Princeton Battlefield, and elsewhere in recent years does not bode well for any other species seeking to share in the sun. Lest one think all is lost, the Oct. 11 Princeton Packet includes a picture of volunteers at the battlefield removing another invasive weed--bamboo. The recent workday was a collaboration of the NJ Div. of Parks and the Sierra Club. The mood was celebratory at the ribbon cutting for two newly preserved tracts along Princeton Ridge. One tract, the 14 acre Ricciardi property, came very close to being developed several years ago. The adjoining 35 acre All Saints Church parcel connects the Ricciardi tract to Herrontown Woods, which in turn connects with Autumn Hill Reservation and additional undeveloped lands towards Kingston. With the 17 acres along Bunn Drive to be donated by developer Bob Hillier, an extraordinary corridor is now preserved, due to the persistence and generosity of many people and organizations. Here's an attempt to list all the organizations involved in the effort: Friends of Princeton Open Space, DR Greenway, NJ Conservation Foundation, NJ Green Acres, Mercer County, Princeton Township, Save Princeton Ridge, Stonybrook-Millstone Watershed Association, and Kingston Greenways. Afterwards, everyone got to say a few words at the reception at Mountain Lakes House, including U.S. Congressman Rush Holt. In the middle of this remarkable corridor stand the boarded up house, cottage and barn of the Veblen homestead. See veblenhouse.blogspot.com for information on efforts to restore these county-owned buildings, to serve as a useful destination that could increase utilization and appreciation of the preserved open space by the public. This photo may not be worth a thousand words, but it started a nice conversation. It so happened that, during one of my ongoing documentations of the export of nutrients from Princeton's yards, the owner pulled in. I figured he'd think, "Oh, just another Princetonian photographing my beautiful grass clippings," but to my surprise he came over and expressed interest in knowing what was so interesting about two blobs of discarded green. It seemed inauspicious to begin a conversation by saying there's a (unenforced) borough ordinance against putting grass clippings on the street, but a mutual interest in composting quickly emerged. I offered news that the county extension master gardeners recommend leaving grass clippings on the lawn, so that all the clippings' nitrogen returns to the soil rather than getting washed down the street into Carnegie Lake. The dreaded thatch buildup of yore, which once spurred homeowners to bag up grass clippings, apparently dissolved into a myth. Grass clippings' high nitrogen content endows them with the power to do great good or considerable harm. Massing them in piles tilts them towards harm. They pack tightly, shutting out oxygen, thereby making perfect habitat for anaerobic bacteria to feast on the rich organic matter. Break open a pile of grass clippings that have been sitting for awhile, and you will learn the hard way that the anaerobic decomposition process produces vapors profoundly repellent to humans. Aerobic bacteria, by contrast, do not produce nasty odors. Therefore, the best thing to do with grass clippings, if one is determined not to leave them on the lawn, is to give them access to air by spreading them in a thin layer either on a compost pile or as a thin mulch under shrubs. Particularly relevant this time of year, autumn leaves, chopped up as one's mowing the lawn, can also be left to settle down into the ground between the grass blades. With contributions from friends, and periodic curbside rescue efforts in the neighborhood, 4 TVs, 2 computer monitors, 2 printers and a microwave were diverted from the landfill and made their way to the Oct. 1 Mercer County electronics recycling event. There, all the rejected middle-aged TVs finally got to socialize again after their long careers of solitary confinement in living rooms, and soon set to commiserating about the boring programs they were forced to show, and the humiliation of being dumped after years of high fidelity for some slim young thing their owners met on the internet. Soon they would depart on their final journey to (we can hope) an environmentally benign deconstruction and recycling facility. Though the delivery seemed a small victory, it also dramatizes how far short society falls in imitating nature's recycling program, which brilliantly deconstructs and reuses any and all of its creations wherever they land.